Later that day the phone rang. I lifted the receiver to hear for the first time, the mesmerizing voice that would dominate my Destiny for the next 20 years. It was the voice of Harry Kislevitz, a Wizard of the highest order. I immediately fell under his spell. His voice alone was captivating, kind, exuberant, and resonating. It was the voice of Santa Claus, calling, from just across the river in New Jersey, to offer me the possibility of making toys, happily ever after. In the days and years that followed I spoke to Harry, hour after hour, nearly every day, and found him to be the most complex and amazing person I had ever known. And his voice, alone, was all there was to know, for although, he lived just a few miles away, he remained only a disembodied voice on the telephone for the next four years. As I had never met Harry in person, at least not until years later, I filled in the missing pieces, with items from my own imagination. Therefore, he could be anything I wanted him to be: a friend, a playmate, a toy tycoon, a God maybe. But most of all, in spite of the fact that he was only ten years my senior and already had six children of his own, this unknown entity, who appeared to possess great wisdom and maturity, became a father figure to me. I never spoke to my own father much when he was living. We never had a conversation, or very much in common. Now here on the phone was Harry Kislevitz, a brilliant complex individual with an insatiable curiosity and thirst for knowledge, who also happened to be the World’s most sympathetic listener, honoring me with his attention, as we mined my mind for toy ideas. To my surprise, we found that there were plenty there. Thus, from 1965 to 1971, we played together, inventing one thing or another. If Harry liked a toy idea he would manufacturer it. There were no holds barred, no avenue in Toytown left untraveled, no chamber in the Castle Colorforms, unexplored. 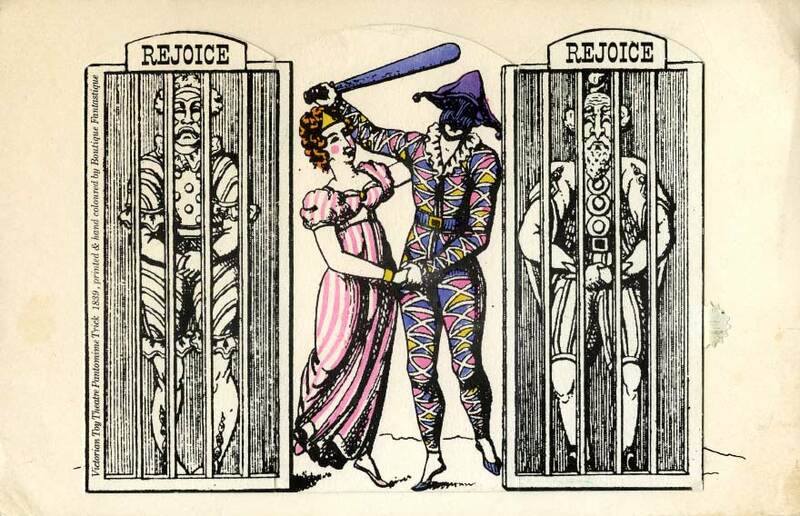 But, like the bride of Bluebeard, there was one door I was not allowed to enter. That was the door marked “Colorforms”. That alone was off limits. Harry had invented Colorforms, the vinyl plastic pieces that stuck to a shinny surface. And he was convinced that there was no idea or application involving Colorforms, nor could there be, that he had not thought up already. In the ten or so years that Colorforms existed, aspiring toy inventors had assailed Harry with suggestions of new ways to use the plastic pieces: stick them on the TV, or the refrigerator, even vinyl snow flakes adhering to the window panes at Christmas. Harry had been there, seen that , done that, and thought about it all before. He had tasted success with Colorforms, and now, rather than build upon it, he wanted to do something new. Thus, he would entertain no further discussion on the subject. The very mention of “stick-ons” was off limits. 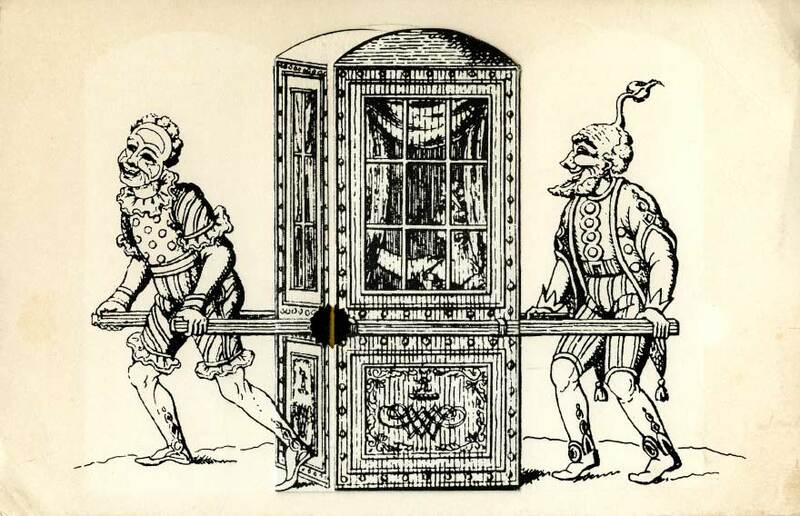 The door to Colorforms was shut and bolted. Until 6 years later, through a curious set of circumstances, I broke it down once and forever. 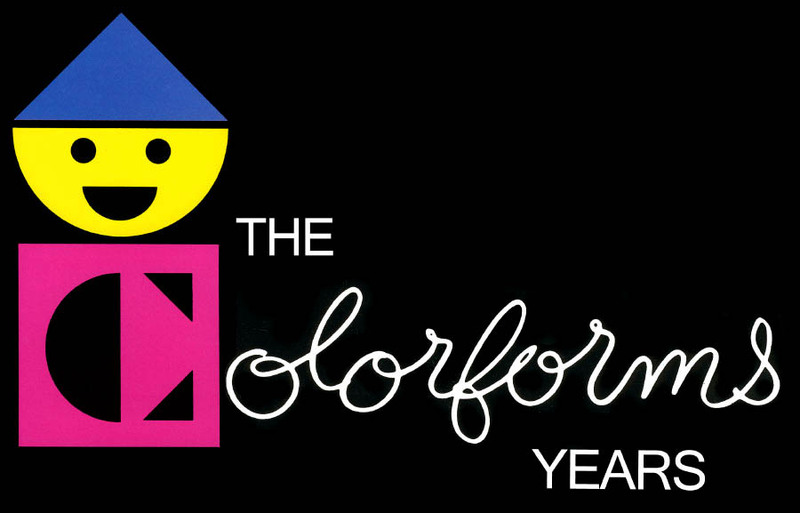 From that day forward I stuck with Colorforms for the next 15 years. Fifteen years that flew away, and in the end, seemed to count for nothing. Along the way I became what Harry called the “Creative Director” a term I never fully understood; for that matter, neither did He. It was all the more confusing as I was never an employee. My remuneration was always in the form of royalties, based upon how well “my”, so called, “items” sold. Nonetheless, I threw in a lot of extra stuff for free. This website chronicles the years I spent in that capacity. (I’m tempted to say captivity) The products shown for each year will not be everything that Colorforms produced that year, but only those I innovated, and for which I received a royalty. These will be presented only in the year and catalogue in which they first appeared, even though, they may have continued in the line for many years. Eventually the role of Creative director came to be anything that I did best. If there was any aspect of any of “my items” someone else could do better than me, like specking type, hand lettering, creating “finished art”, etc. they got the job; for which, by the way, they were handsomely paid. On individual items, compared to my measly royalty, these artists made out much better than me. But, across the board, as the number of “my items” multiplied, it added up to a good living. 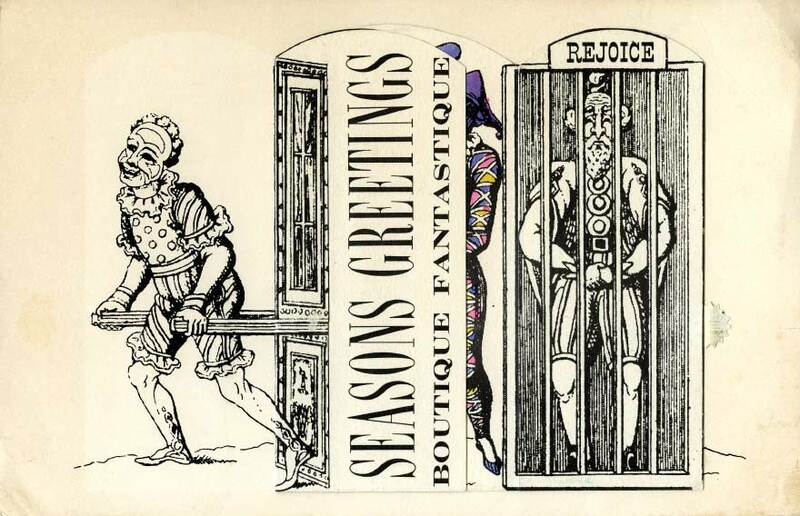 On December 19th, 1964 with Christmas just a few days away, an article about Boutique Fantastique appeared in the New York Times. 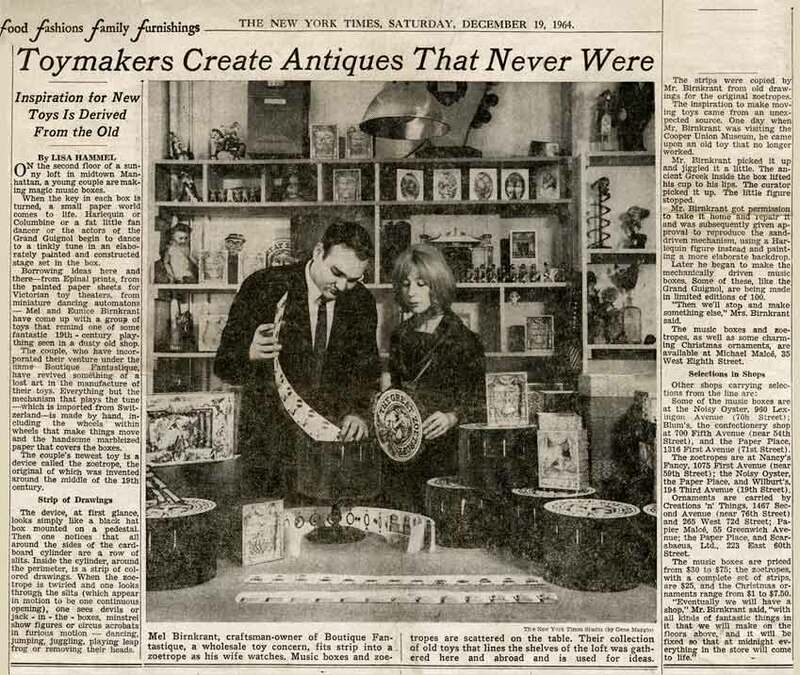 In the early 1960s, My wife and I ran a small business in New York City, handcrafting “Authentic Reproductions" of antique toys and music boxes that never, existed in the first place. It was called, "Boutique Fantastique". The name was derived form the ballet “La Boutique Fantasque” by Respighi-Rossini, and translates into English as “The Fantastic Toy Shop”. Fantastic indeed, for all the toys and dolls there came to life at night. The concept and the music always intrigued me.